We knitters have lots of strange and wonderful terminology that normal people don’t use. Every time I try to type “tink”, my smart computer changes it to “think”. So helpful. Not. I’ve done plenty of “tinking” (changed helpfully to “tinkling”) and “frogging” (thankfully a real word) in my time. You know those nice socks I showed you in the last blog post? Frogged back to the toes. This means that something went completely and irretrievably wrong, couldn’t be corrected, and had to be ripped out, unraveled. Started again. The problem with the socks was that I tried to wrap the stitch pattern around the sides of the foot without really leaving room for gussets and then trying to make a normal heel from there. Of course it didn’t work. I then tried to make a short row heel, but that uses at least 60% of your stitches and if 60% of your stitches are a fancy lace stitch pattern, it just doesn’t work. Frogging was the only answer. I modified the stitch pattern again, made it different for the foot and leg sections and decided to try Cat Bordhi’s Sweet Tomato Heel. Now here’s a woman who has a way with words. She uses the cutest terminology for the techniques she develops, like the “thanks ma” method for short rows. You have to look it up or buy one of her patterns to get the explanation. She calls these heels Sweet Tomato because the resulting fabric is so smooth and perfectly curved that it’s like a perfect tomato. Who can resist that? Here’s my result. And here’s a photo with the sock turned inside out so you can see what my inside looks like. I wanted the heel to be reinforced so I slipped every other stitch on the purl rows. And I offset those slipped stitches every other purl row. It makes for a nice cushy reinforced heel that fits really well. 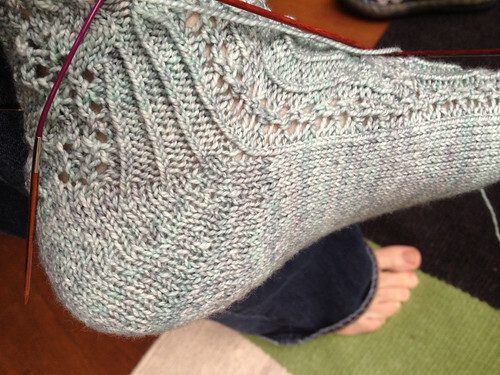 Here’s the sock, still not quite finished, but now being worked up the leg. I’m not sure how I will finish off the stitch pattern, but I have a few ideas. 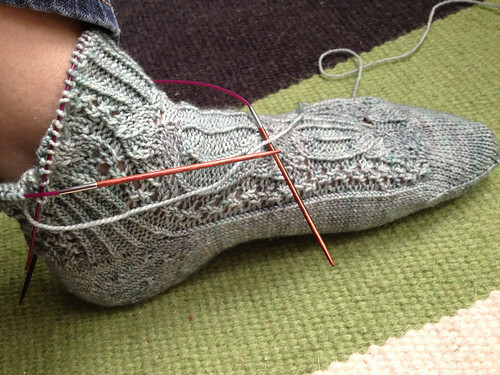 I like this heel, but it won’t work for all types of stitch patterns. You have to be able to use 60%-65% of your stitches for the heel without messing up your pattern work. That won’t always work. But when it does work, it’s a great heel to use. I fits and feels great and it’s easy to modify it to fit your foot. 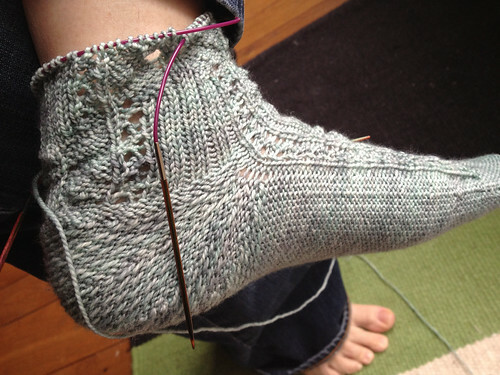 I highly suggest buying one or more of Cat’s patterns, or her entire e-book, to learn about the heel and it’s possibilities. I bought the Zebra sock pattern and then modified the heel for my slipped stitches. She also sells a pattern with padded heels but I haven’t checked that out yet. If you are a seasoned sock knitter you can probably figure it out yourself. Now, back to knitting these socks to find out if the ending comes out as planned. Designing your own socks is a nice adventure! Aaand I just realized why my short row heels have never fit. Those socks are beautiful, I can’t wait to see the finished product!